13th February 2017. Parish Council votes to register the parish as a Neighbourhood Area, enabling it to work towards producing a Neighbourhood Plan. Volunteers with appropriate skills/expertise sought to assist. South Northants Council confirmed the application for Neighbourhood Area status. Silverstone Parish Council vote unanimously to support the production of a Neighbourhood Plan. Parish and Neighbourhood Planning was introduced by the Government in 2011. It offers, for the first time, communities such as ours a pivotal and legal role in controlling unwanted development and shaping the sustainable evolution of our village. Readers will be aware that the Parish Council has produced a "Parish Plan and Village Design Statement" which was adopted by South Northants Council in July. This is available as an attractive, highly readable and collectable brochure describing our village and its fascinating history; it is available for sale at Crofts store for a sum of only £3. 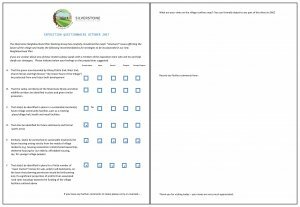 This document now has the status of a "Supplementary Planning Document" within the suite of SNC Local Plan documents which inform all planning decisions in Silverstone. This means that it must be referred to in judging all applications for planning permission in the parish. Due to Silverstone's attractive and "open" form, its special locational advantages, a beautiful hinterland and the success of local Circuit employment initiatives our village is uniquely susceptible to unrelenting pressure from land speculators. The primary instrument for protecting the village from such unwanted development is the statutory South Northants Local Plan and we rely on our District Council to keep this document up to date and to maintain a supply of sites in the whole district well in excess of five years in order to meet Government targets. However, in a national environment where our own Government admits to a "broken" housing market and sites even in the Green belt are now being mooted for development, no statutory Plan can offer an absolute guarantee that unwelcome development will never be allowed (for example by an independent government Planning Inspector). Furthermore, government policy on housing and planning law can change at very short notice. A Neighbourhood Plan offers an extra layer of "insurance" against inappropriate development, over and above that of the approved Parish Plan, since the process for the approval of a Neighbourhood Plan is very rigorous. When approved it actually becomes an integral part of the District Local Pan. This is why our Parish Council unanimously agreed to proceed with the production of a Neighbourhood Plan in May 2017 and to set up the Silverstone Neighbourhood Plan Working Group (SNPWG) to achieve this. This Team comprises a dozen or so village volunteers and meets monthly in our splendid new village school. In a very short period of time this volunteer Team put together the Neighbourhood Plan Exposition which was held at the SRA between 28th October and 5th November. This event was a huge success and many thanks to one and all for making it so visually attractive and function so well. The December Parish Plan exhibition held in December last year had an attendance of well over 200 and 45 written comments were posted. Whilst we did experience some quiet moments at the recent Neighbourhood Plan event there were times when our small support team was quite overwhelmed by the assembled throng. Total numbers were impossible to judge but, amazingly, we have over 150 written responses to our Questionnaire. Some of you have produced veritable, detailed essays on how our village should evolve and the team looks forward to analysing these responses and to drawing some conclusions for the way forward. We aim to prepare a summary of responses and conclusions for the next issue of News & Views. A particular favourite was "Silverstone the Movie" produced totally in-house by the team and with vital support from our drone and gyrocopter pilots. Fans can look forward to "Silverstone the Movie II" which is now under production with the promise of assistance from personnel at our local University Technical College. It was most gratifying for Team members to hear of the pride which parishioners hold for their village and their commitment to its future. Particularly striking were the number of younger families who had made a special decision to locate here to enjoy Silverstone's special qualities and who fully recognize that it can and should evolve in a sensitive way in order to meet their families' future needs. The next public participation event on the Neighbourhood Plan will be held in late winter/spring 2018 when the Team will address the much more difficult task of presenting various analyses and options for our joint sustainable future. We look forward to meeting as many of you as possible at that event. Over the winter we shall be gathering all the necessary data, surveys and information to help the village inform and guide this process in a systematic and objective way. Our meetings are held at 7.30 on the third Monday of each month and are open to all parishioners. If you have a particular skill set which we need, such as an ability to operate AutoCAD, please contact us.